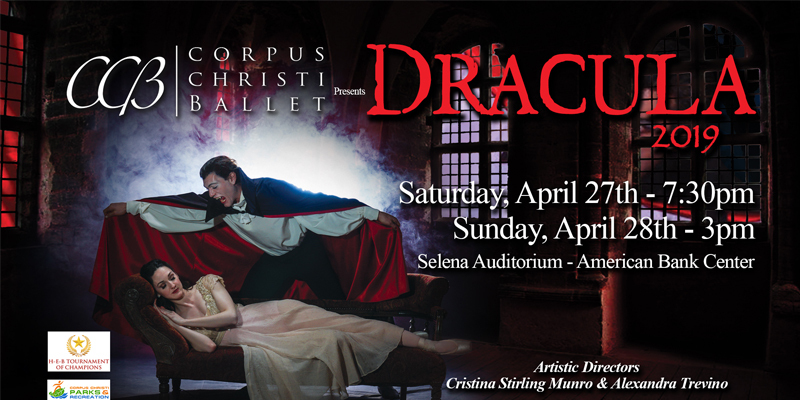 The Corpus Christi Ballet will present the dramatic ballet “DRACULA” on April 27th and 28th at Selena Auditorium, American Bank Center. This enthralling and vivid adaptation of Bram Stoker’s Gothic masterpiece will be performed by over 100 dancers, actors and guest artists to a gripping spine-tingling score. This ballet is an original production by Corpus Christi Ballet’s Artistic Directors Cristina Stirling Munro and Alexandra Trevino and has sets and costumes that are complimented by eerie and supernatural effects. The unique drama blends exciting dancing, acting, and stunning special effects to bring to life this dark story of love, bloodlust, loss, and redemption. The action will lead you from the streets of London to a mountain pass and Dracula’s Castle in Transylvania. You will then go back through a storm to a country mansion in England, and finally to the Crypt. For the lovers of Twilight and Vampire stories, this powerful ballet combines beauty and drama that will chill and thrill you at the same time. The production will feature professional guest Artist Shea Scott Johnson as the insatiable Count Dracula. The beautiful Mina and the doomed Lucy will be danced by Elizabeth Hooper and Mia Carvalho respectively, and James Vargas will dance the role of the hero, Jonathan Harker. The colorful cast will also include Draculas “Brides”, Sirens, Villagers, Gypsies, a Fortune Teller, Wolves, Night Moths and Vultures. To purchase tickets or for ticket information, contact the Corpus Christi Ballet business office at 361-882-4588.